Benefits leaders are always considering how new digital health programs can save costs, increase employee engagement, and ultimately provide better health outcomes. And it’s an exciting time to be a leader, as new solutions seem to burst onto the scene every day. It’s easy to get caught up in the latest innovations, but what do employees actually want? What programs are most attractive and useful to the people we serve? To find out, we launched a research initiative with Employee Benefit News. We surveyed more than 1,030 U.S.-based employees at large organizations about their overall health goals, how they use digital health tools, and what they want from their employers. Our aim was to understand how employees currently utilize digital health, as well as how they rank their health goals. We also dug into their overall appetite for digital health technologies. Through our research, we learned a lot about employers, employees, and the gaps between their perspectives. In this article, we’re sharing some trends on what employees want from digital health solutions in 2018, as well as their top health goals. Here’s what you need to know to adjust your offerings to meet employee’s digital health desires. Across the board, employees want to lose weight. In our survey, 45% of respondents reported that losing weight was a top digital health goal. This was followed by saving for retirement (30%), sleeping better (27%), and reducing stress (26%). Even so, employees are not necessarily turning to their employers for help with this goal. Many employees (64%) turn to weight loss technology on their own, as opposed to going through an employer. One of the biggest ways that employers can support employees is by offering solutions to help them manage chronic health conditions. For employees who identified managing diabetes as a top health goal, 57% reported they use technology to meet their goal. Diabetes technology has undergone significant innovation in the past few years, and many employees are taking advantage. 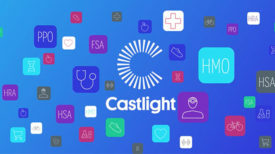 Castlight’s ecosystem partner, Livongo, has seen rapid and high adoption rates from both employers and their employees in the past years. When it comes to digital health programs, employers often jump in to foot the bill. Many of the programs employers offer are free to their employers. Given the choice for free programming, most employees would choose to get help with retirement. However, when we asked employees which solutions they would be willing to pay for themselves, 67% listed smoking cessation, 64% listed helping their children lose weight, and 62% listed planning a healthy pregnancy. Given the opportunity, employees will pay for the right solution, which is important for benefits leaders to know as they make choices about what to subsidize and how to do so. Currently, many employees access digital health technologies on their own, without turning to programs their employer offers. Lifestyle goals, such as losing weight, improving nutrition, and going to the gym more were areas where employees were more likely to bypass their employer and seek out their preferred digital health technology solutions. When it comes to saving for retirement, comparing healthcare costs, and getting support from private counselors, employees were more likely to turn to their employers. No matter the generation, all employees want access to digital health solutions, and there wasn’t a lot of difference across generations. The number one goal for boomers, gen xers, and millennials was to lose weight. Other top goals included reducing stress, sleeping better, and improving nutrition. The only exception is around saving for retirement, which makes sense based on the ages of the respondents. Employers are doing their best to choose the right digital health offerings for their companies, but are there choices aligned with what their employees want? This article covers a small sampling of the insights found in The State of Digital Health 2018 Report. To learn more about how employers and employees engage in digital health programs, download the report.